Jogging your memory on this Memory Afghan from the Floral Fiesta Afghan pattern by Maggie Weldon. I started it in Nov 2014 & completed on Jan 10th 2016 spanning two winters. I am entering this as my very first Pinterest Challenge. The challenge has entered its 2nd year and we are now the Pin Chicks !!! 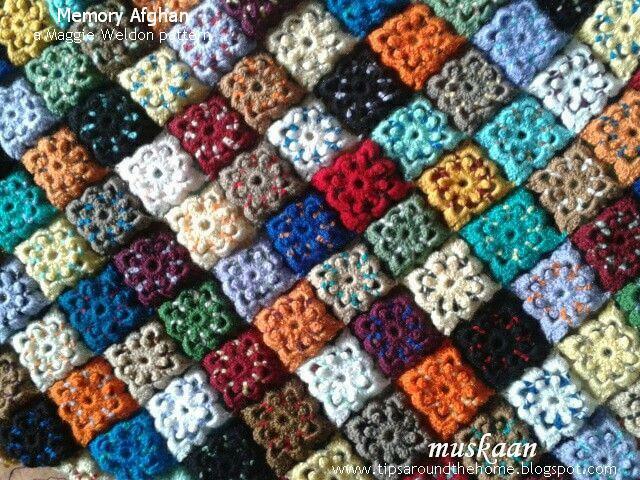 It is a novel idea started by 2 bloggers Suzanne & Margaret to choose one pin every month & do the project/task/activity. It can be Anything you wish, and everybody posts on the last day of the month. Adding to the fun & mystery, the project remains a complete secret till posted. So why am I picking this as my first Pin Chick project ? Because it all started two years back with this pin on pinterest ! The image immediately caught my fancy – such a beautiful pattern that would use up my yarn stash! A stash that had built up over the past 20 years from leftover yarn. 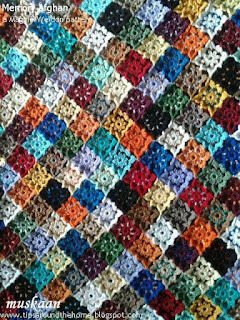 Later, in my bid to work out a border/edging, I referred to several other pins. 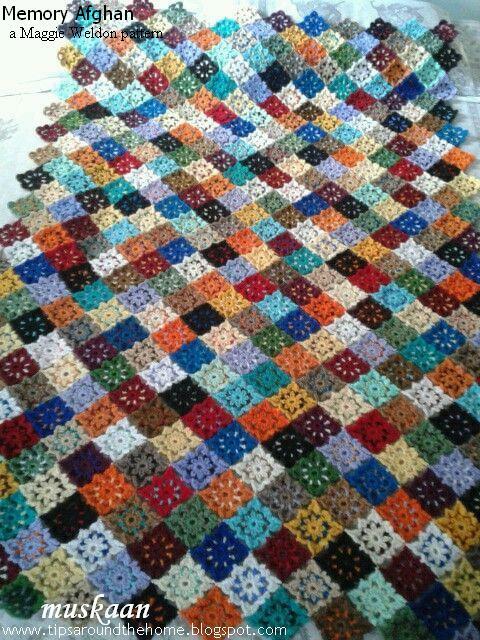 Following the strong & almost unanimous preference here to use a lighter colour for border, I had lined the periphery with darker colours/shades. 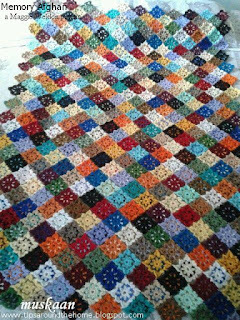 This would create more of a contrast with a lighter border.After joining 12 motifs, laid point-to-point, along the breadth & 18 along the length, I decided it was complete, and required only a border & edging. 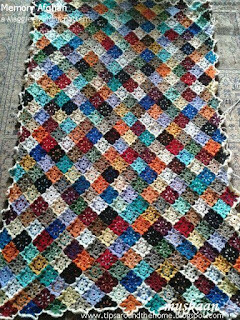 Maggie's pattern does not have any border/edging ; she weighs down the points with tassels. Tassels look very pretty but are not always practical. So I had to figure something out. I did so want to keep the ridges intact - no plain old rectangle ! Following is some of what I tried. This is inspired by another pin here, with image only & no pattern. 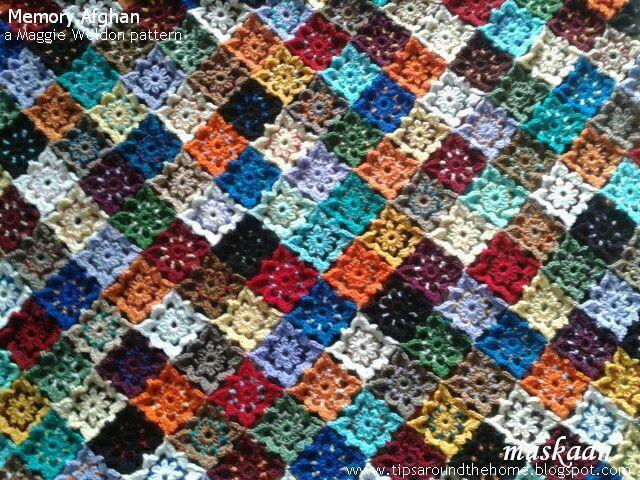 I looked at many other pins on my Crochet Stitches & How-tos board for inspiration & pattern, but loved the slight overlapping effect created by the spike/dropped stitch. Spike/Dropped stitch : Insert the crochet hook through the base of previous row & pull up a loop to crochet. 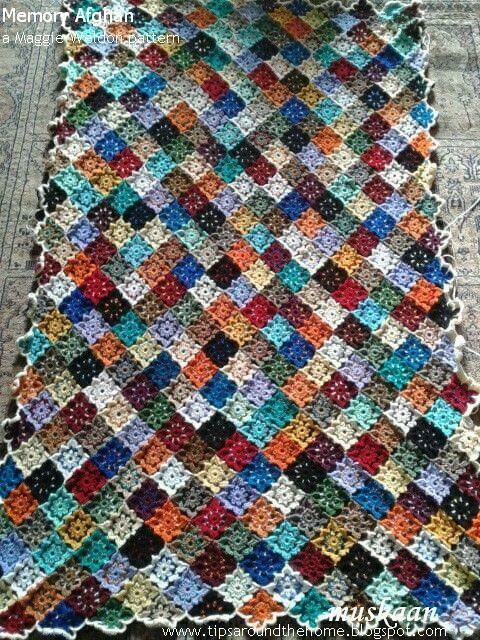 Picot : chain 3, slip stitch in 3rd chain from hook. All stitches are worked in/through the back loop. 3 in pic, in black : Row 4 - slip stitch in back loop, and spike stitch at notches. Trial 2 : The single yellow row got lost between the white & black. Hence I added one more yellow row, worked same as Row 3 above. Thus 2 white, then 2 yellow rows. The spike stitches are more clearly visible here, although the lack of contrast between white & yellow masks everything. The last row in black, with slip stitch in back loop & the spike stitch at notches, adding a picot at the tip. I liked the well-defined arched look, & tried it around some more motifs for colour-play. 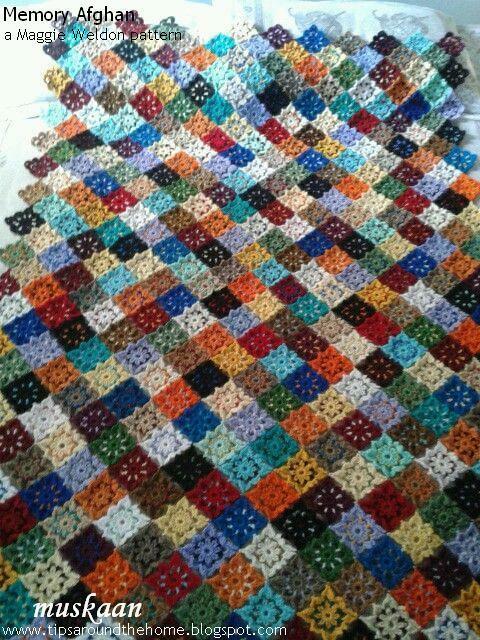 After the final black row, the edging seemed to flatten out too, & I hoped that with usage, it will flatten out further. 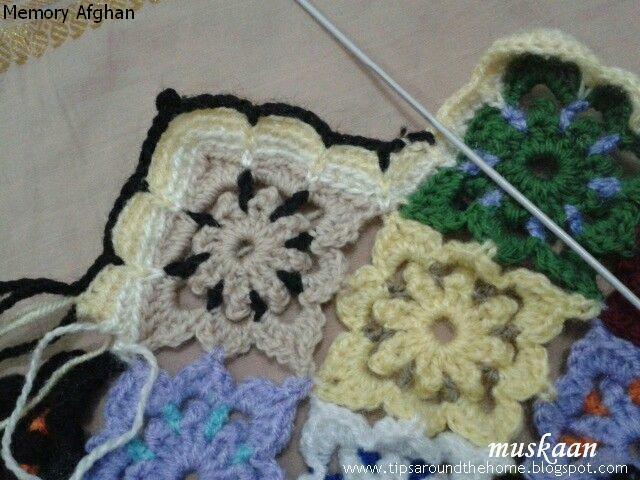 So, got right down to work around the entire afghan. Two rows of border completed, using off-white/cream wool. Note to self : always do your homework first , use Same yarn for trials as for final version, & don't bite more than you can chew ! This is where I left off last season. So what did I do next ? Continued / Corrected / Changed / Chucked ??? For the grand reveal to this great suspense, wait a while coz I still have to take photographs, teehee . from the wrong/back side. Yes, lots of ends to hide ! (in alphabetical order ; click on name for respective blog)! These are a few effects I came up with over the last few months. Haven’t had much time or patience to develop or refine them . I also wanted to share something ‘new’ (I hope) at the start of the new year. So, here's a sneak peek at some of the effects I have in the works (some my own, some borrowed) ... these are still in experimental stage & some kinks to be worked out … but they are pretty simple . Crochet & knitting have a magic circle/ring, ...so why not tatting ? Should we be left behind ? Nnnnnoooooooo! All one needs is a loop with a slip knot OR a simple length of scrap thread (if one wants decorative, use different colour, or a ribbon, etc.) . 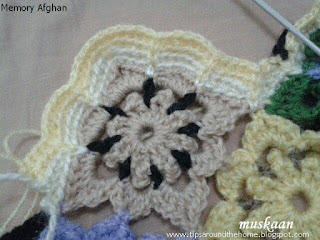 Skip the central ring in the pattern. Begin tatting the pattern & when it says to join in center or to a central ring, join instead to this loop – a normal picot join. That’s it ! Take care not to pull the loop thread through when tensioning the join. In end, tighten the slip knot & hide tails. This was back in October but it took a while to think of wider application & usefulness. I believe it has potential for designers to estimate round size, or how many repeats can fit in a certain diameter, ... as well as for tatters faced with certain situations – such as not having the right sized finding/doodad/button ; to cover tree ornaments (baubles) easily (slip on/over & tighten ! ); estimate girth of suncatcher, etc….. Join many individual motifs to the magic string to make a bunting or a necklace! The magic circle can't even be seen if pulled tight. But if one wants it to show, That's possible too. A wrapped-around effect for rings, worked with only 2 shuttles normally. The wrapping itself is Very easy & can be applied to any single shuttle ring (Not split rings, though) with or without picots. Start ring. Make 1st half stitch But before tensioning it, pass SH2 through, along the core ((just as we do when hiding tail within)). The continue tatting normally. Before closing ring, pass SH2 through the ring, wrapping around it. Close ring normally & continue. The wraps can be made on picoted rings too (topmost ring in above pic). If one wants the wrap Within a picot, one will need to position SH2 before starting the picot. This effect can be a bit fiddly at times since the wrap does not slide easily over the double stitch & may have to be nudged into position. Secondly, if one chooses to place colours in a certain way, there is a tendency for the wrapped thread to be pulled tight accidentally (unless one uses a shoelace trick). So this is a ‘flaw’ I need to fix with a few experiments. I have a few advanced effects in mind for this … let’s see. Also tried the blanket stitch for fun :-) I like the look in the 2nd pic, where the picots make a nice angle & also anchor the wraps. It is fine to decorate a single ring but I wouldn’t recommend it for multiple rings – it is very difficult to obtain tension, being a topstitch. Simple split rings (SR) ! 3 in a series, joined back at base of 1st SR. Gives a ‘free swinging’ middle (top) ring. This has potential for 3D tatting, where one or more rings can be joined to picots on topmost ring, thus providing an enclosed cylindrical or barrel shape (something like the layered rings here but where the lower rings/petals are vertical too !). Tatted Bugle beads ?!!! Or 3D flowers of course. If the stitches on the 2nd half of each split ring are increased, one gets this overlap in center. Imagine if one were to use 2 thread sizes – 20 for 1st half of SRs that form a peripheral outline ; & size 40 for 2nd half of SRs that give a clear overlap. Experiment with more number of rings to see what kind of overlap one gets. Look Ma, no Celtic shuttles ! (This is not my original idea, hence post titled “Mixed” effects). 3. Doubled up chain . One can add a vsp to chain & join before starting 2nd ring. 4. Further Ideas : use 2 thread sizes - thicker rings & thinner chains. Make a separate ring or use a metal ring. Wrap the cotter pin chain all around the ring/large chain, covering it completely. Something like enraptured ring – this is something I really want to try out – it would look so nice as the center of a flower or around a cabochon, pearl, etc. ! 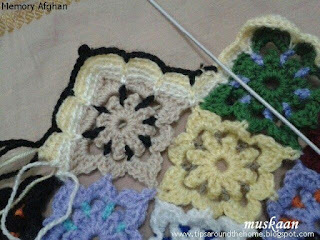 Ending with a quick & easy pattern using daisy picots to welcome the new year …. Very quick to tat & use up scraps of thread. 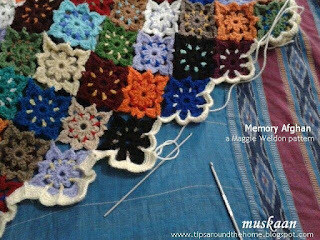 Daisy Picot technique. Repeat from ♥ for 6 'petals'. Close ring. T & C ! These flowers are going to be sewn to an embroidered neckline, hence I left the tail ends long, to be sewn through the fabric later. Notice the difference between front (top & bottom pics) and back (above pic) of flower ? Here’s wishing all my readers & visitors to this blog, a very happy new year ! And keep your muse working to inspire us all with your projects . I thank you for your support throughout. Your comments always inspire or make me introspect; silence can be quite revealing too. No new resolutions this year. I just hope to carry on, doing new things but also trying to bridge the backlog. I will be joining the Pinterest Challenge, though ! It began with Margaret & Suzanne, then Carollyn joined in a few months back. It's really very simple - all you need to do is select one pin every month from pinterest & do it - it could be a craft, a DIY, anything really that you think you want to do. Keep it secret till the end of the month when each posts their challenge. I've been pinning for over 2 years & have wanted to try out a lot of stuff; this is my motivation/impetus/nudge to finally try some out ! We're calling ourselves the pinChers & hoping many more of you will join us :-) One small "pin"step at a time - that's what it's all about. Is there Anything you would like me to change in my blog/posts ? What improvements would you like me to make ? Please leave your suggestions - all feedback & criticism is appreciated.